I’ve been a fan of banana bread since I was a young girl. Give me a glass of milk and a thick slice of banana bread and I’m one happy girl! To achieve a super moist banana bread, I believe it must include one or more key ingredients: buttermilk, yogurt or sour cream. Our Favorite Sour Cream Banana Bread is made with sour cream and buttermilk. I’ve been making banana bread for years. First, because I love banana bread. Actually, I love almost any quick bread. Wonder why it’s called quick bread? Breads that are leavened by using something other than yeast or eggs to leaven (raise) the dough or batter are considered to be quick breads. Usually, sweetened breads such as pumpkin bread or banana bread are referred to as quick breads. The second reason I make banana bread frequently is I often have bananas that have over ripe on my counter which end up either as a smoothie ingredient or in banana bread. The best type of banana for this recipe is a very ripe banana. At least two weeks old. I tend to place bananas in my fridge when they start to become too ripe. When they are really past their prime, I peel and then place them in a large ziplock bag in the freezer for use in baking. When I want to use the banana, I remove from the bag, microwave for about 30 seconds or until thawed and then use as directed. Yes, the banana will totally be slimy and soft, this is the best texture for banana bread. Remember, you want the bread to be moist, and a very overripe banana will produce moist bread! The key to making moist banana bread is using really overripe bananas, and also using either buttermilk, yogurt (I like plain Greek yogurt) or sour cream . It is almost impossible to make dry banana bread if you use these ingredients. This recipe will convince to add sour cream in your next batch of banana bread. How many times have you had a little leftover sour cream in the fridge and no plan to use it? Mix up a batch of banana bread and freeze the loaf for later. It is the perfect way to use up ingredients that might otherwise spoil! When you’re ready to eat or share, let it thaw on the counter for an hour. If you are gift giving, I like to wrap it up in some parchment paper and tie with a bit of Baker’s Twine, which I have in several colors. I know you’re going to love this recipe. It’s quick and easy and a good excuse to fire up the oven on a cold winter day. Happy baking! Grease and one large or two medium loaf pans. Preheat oven to 350 degrees, place rack in middle of oven. Place the butter in a bowl. Mix butter and sugar together until smooth. Add sour cream and eggs. Beat until smooth again. Add buttermilk, bananas and vanilla. Mix until all ingredients are incorporated. There may be a few bits of banana that are not completely mashed. Add all remaining dry ingredients. Mix on low speed just until wet and dry ingredients are combined, about 20 seconds. Do not over mix, do not mix on high speed. Spoon batter into prepared pans. Bake at 350 degrees for 40 minutes (for two medium pans) 50-55 minutes for one large loaf pan, or until toothpick inserted in middle of loaf comes out with a few moist crumbs attached. When the loaf is touched in the middle, the loaf should spring back. -This recipe will make one large or two medium size loaves of banana bread. -The recipe calls for 1 1/2 cups or about 2 medium bananas. The bananas will vary in size. I usually do not measure out the bananas added to the recipe. It is not necessary to mash the bananas beforehand if using very ripe (mushy) fruit. If the bananas will not easily be broken up with the mixer, mash ahead of time in a bowl or cup with a fork.-This recipe freezes well. Let the bread cool completely and then let sit on counter, wrapped in saran wrap to thaw. Slice and serve.-When filling the pans before baking, the batter should fill the pan about 3/4 full for a nice rounded loaf top. Thank you. There are huge differences in banana bread. Most are dry and tasteless. This was super yummy and moist. It’s my new “go-to” banana bread recipe. I made three loaves and a dozen jumbo banana muffins too! I used plain yogurt instead of sour cream. I (obviously) made enough to share, and my family and friends were so glad I did! We ate it for breakfast, lunch and dessert. I made these tonight and they are absolutely delicious. Will be my new banana bread recipe. Thank you! Nicole, Thanks for reading ABK! I’m a banana bread fan as well and love this recipe. 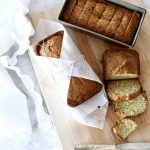 this is our favorite banana bread, and I have tried sooooo many from different bloggers…. This turned out so great. My Mother in Law always bakes her banana bread in a Bundt pan, so I’ve adopted this too. It turned out perfect baking for 45 minutes. This is delicious! Definitely a new go-to recipe! I whipped up a maple glaze for the top. Very treaty and perfect for a cold winter day, thank you!! Maple glaze sounds wonderful. Thank you for your positive feedback. Love this recipe! It is so moist and yummy. Thanks for sharing. Thanks for your positive feedback. I’m so glad you like it! This is a great recipe to make a double batch of and take to a neighbor. Enjoy! Easy and delicious! I added walnuts and I must say it was the Best banana nut bread. Hi Rachel, I haven’t tried making this with alternative sweetener before. I’ve heard stevia/truvia is a good sweetener to use. You could try that, just make sure to follow the measurements according to the package (stevia is usually a lot sweeter than sugar). Hope this helps and thanks for asking! Sorry for the confusion, Leslie, it’s supposed to be buttermilk and either yogurt or sour cream. Hope this makes more sense and thanks for asking! Thanks for the perfect banana bread recipe! With recipes in the past the cooking time was always off for me. I found it either being too dry or undercooked. But this recipe was perfectly accurate. I doubled the recipe and poured it into two medium loaf pans. I didn’t have quite enough leftover for a third loaf, so I stirred in a few chocolate chips and got just less then a dozen banana chocolate chip muffins. My family gobbled everything up in a weekend! Most moist banana bread I’ve ever had! I made one big loaf and ended up having to leave it in about 20-25 more minutes. 55 minutes just wasn’t enough for it to cook in the middle completely! The sour cream really adds such a difference to this banana bread. The cooking time can vary depending on how high you live and what the type of oven, but I’m glad it turned out so well. Thanks for sharing, Hailee!